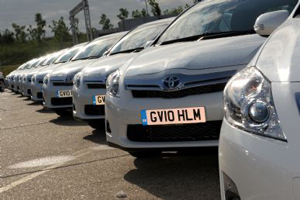 Company Car in Action, a b2b event aimed at fleet buyers, has confirmed that manufacturers including Toyota, Lexus, Vauxhall, Seat and Fiat will attend this summer's two-day event. Taking place on the tracks of Millbank in Bedfordshire, fleet managers will get behind the wheels of models including the Vauxhall Ampera, Toyota Yaris Hybrid and Honda Jazz, on high-speed and off-road tracks. The event takes place on 26-27 June and is organised by Bauer Media title 'Fleet News'. Chris Lester, event director at Bauer Media, said: "We return to Millbrook year-on-year because of the variety of tracks and circuits on offer. "Visitors comment that they just couldn't achieve as much real-world driving experience or get to speak to the manufacturers face-to-face at any other UK event. This year the show will feature a series of fleet management advice clinics, an electric vehicle zone, increased opportunities to drive light commercial vehicles and a dedicated leasing lounge.